For the WWII Signal Corps Military radio transceiver BC-1000 / SCR-300. 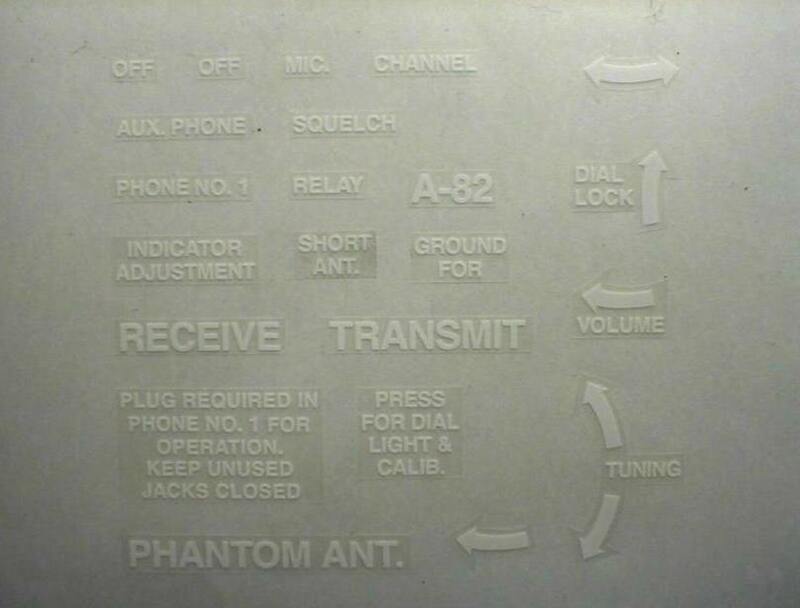 This is a new reproduction lettering transfer set for your BC-1000 radio restoration. It is printed on very thin flexible 3M Scotchcal adhesive film backing. Done in low gloss matte finish to cut on light glare and represent the original silk screen process as close as possible. Also, this set is complete with the double headed tuner adjustment arrow that is missing from the older water decals sets that were around. Make sure your surface is clean and dry before applying. I recommend using a clean exacto knife to separate the decal from the backing. Make sure also if your handling the transfers your hands are clean as the adhesive will pull the dirt from your hands. Surface should be room temperature and on the warmer side if possible. Adhesion will increase the longer the decal is in place. I have darkened the contrast in the photo so it is easier to see the decals on the backing. The lettering is white as the original. There is no option for USPS postage but that is how I will ship to save money. I will refund you the UPS difference minus PayPal cost.